The New Yorker opened the week in a lather of controversy surrounding the cover of its latest issue. The Barry Blitt illustration is a rather heavy-handed satire of the various smears that have circulated about Barack and Michelle Obama. Essentially, that he is a closet Muslim extremist and she a closet militant. Blitt’s unsubtle drawing portrays them in the garb of these personas. Speaking as a New Yorker fan, I can’t stand these political satire covers. Aside from them not being very funny or interesting to look at, they lower the New Yorker to the level of the fray. The key to the New Yorker’s success, however, has been its ability to place itself above all that. Yes, the New Yorker is quite obviously a left leaning publication, but its journalism strives for even-handedness and the entire enterprise is built on a reverence for the facts, as its legendary fact-checking operation attests. By “the fray” I do not just mean politics, I also mean the “here today, gone tomorrow” jokes and the offhanded irony that seem to permeate most of our culture. The New Yorker, meanwhile, has always been so (justifiably) secure in its status, that neither its contents nor even its ideological leanings require an advertisement on the cover, which historically has been given over instead to a piece of art that exists simply for its own sake. The political covers come across as jarring in this context. A couple of years ago another political cover caused a bit of controversy. The Bush/Cheney cover was a tired Brokeback Mountain rehash that got people riled up, and, as it turned out, it bumped a cover that was more topical and far more meaningful and in the spirit of the magazine. Apparently, I may have been in the minority in this view, as the Mark Ulriksen Brokeback cover, along with a political Blitt cover, won awards. It’s not even the political content of these covers that bugs me – there have occasionally been some good political covers – it’s their heavy-handed unfunniness that paints the magazine’s readers with a very broad brush. I don’t find the Obama cover to be offensive in the least, just easy and dumb. If you feel the same way I do (or even if you think I’ve lost it), dig into the archives and enjoy the hundreds of sublime and clever covers that have graced the New Yorker over the years. 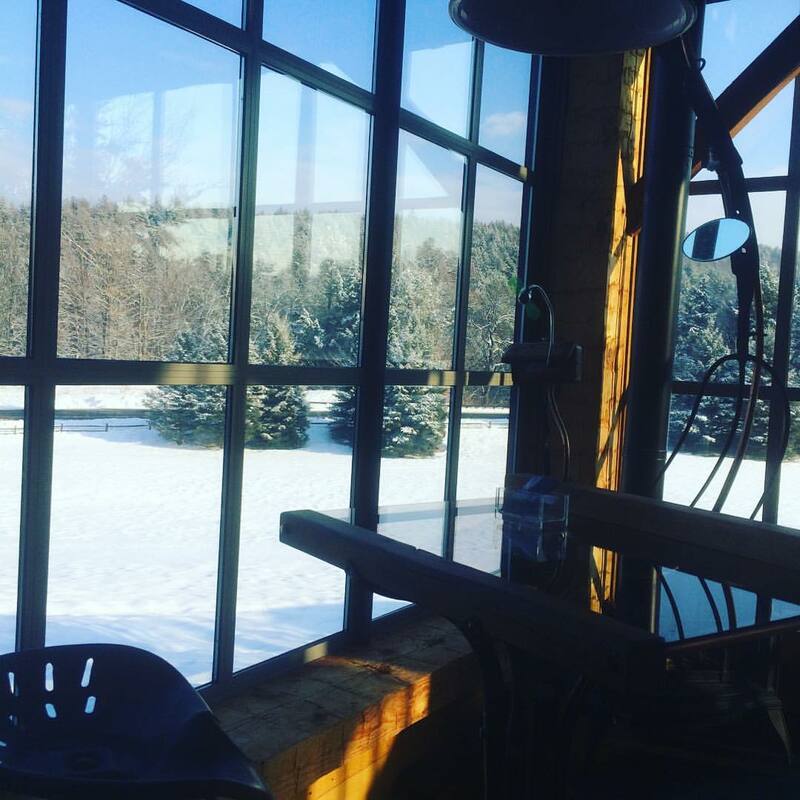 My earlier post was about artist residencies, these magical places that take the writer out of her workaday world and into a new place, just for the artist. No need to let answering the phone or procuring and cooking food slowly chip away at one’s day. Because it’s expensive to house and nurture artists, many residencies need public funding, which will be in danger for the next four years. Airplanes, with their engine-whines and the threat of the seat recline crushing your laptop, aren’t great spaces to work. But once, when I was stuck in an airport for a few days (ironically, on the way to a residency), I had the time to realize how delicious it was to be the still point in a hub of transit. Everyone was so focused on their destination, I was as anonymous and private as if I were in a cabin out in the woods. There was plenty of food, comfortable chairs, even a branch of the Tattered Cover bookstore. Had I wanted it, legal pot was just a cab ride away. 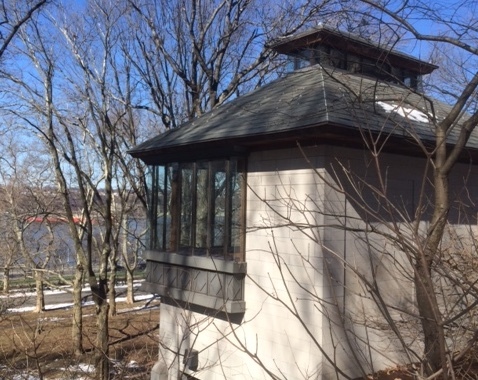 I don’t actually know how to get into this house, but it’s a quiet little hut that overlooks Riverside Park in New York city (which is much quieter than Central Park). And every time I pass this house, it looks so reminiscent of the studios I’ve been in, say, at Yaddo. The place looks like it gets plenty of sun and there’s an Ecuadorian food cart just a few hundred feet away; in the spring summer and fall there’s a bar/ restaurant that operates inside the park. Perfect! I couldn’t have been more charmed by this rest stop, a wood stove, a solarium with its plant powered waste-treatment plant. There were desks and a view, as well as unlimited coffee, and, I was told, sometimes they provided Twizzlers. Who doesn’t like a little Vermont socialism? I actually have a nice little office, by New York City apartment standards. Faces a quiet street, expansive desk. Now, if I could just get my spouse to take a break from being a professor and devote his day to making meals that he can tuck into a picnic basket, we’d be in business. What are your fantasy residencies? Of Fracking and Franzen: Is Strong Motion Coming True in Oklahoma? Jonathan Franzen’s second novel, Strong Motion, was about a mysterious outbreak of earthquakes in Massachusetts. The novel’s heroine, seismologist Reneé Seitcheck, discovers that these earthquakes are the byproduct of industrial drilling. The responsible party is a petrochemical firm whose agents attempt to assassinate Seitcheck after she proves that the company’s practice of injecting toxic waste into the ground is the cause of the bizarre quakes. Something oddly similar might be happening in Oklahoma (which, like Massachusetts, is not your traditional hotbed of seismic activity). This past Saturday, a 5.6 magnitude earthquake struck the tiny town of Sparks in Lincoln County, Oklahoma. The quake was one of the largest ever recorded in the state’s history, and another example of the sharp increase in seismic activity Oklahoma has experienced in recent years. Up through 2009, Oklahoma had averaged about fifty earthquakes a year. The total number of quakes reported in 2010? 1,047. This swift and dramatic change in Oklahoma’s vulnerability to earthquakes has some people wondering if the practice of hydraulic fracturing — or “fracking” — might be the culprit. Fracking is the process of injecting highly-pressurized fluids into the earth to break up shale and rock and release otherwise inaccessible sources of natural gas. The waste fluid is then shot back underground at sites called “injection wells.” There are 181 active injection wells in Lincoln County Oklahoma. Energy companies deny that fracking causes earthquakes, and seismologist Austin Holland at the Oklahoma Geological Survey told the Associated Press there’s no reason — at this point — to blame these quakes on anything other than normal seismic activity. The strong spatial and temporal correlations to the hydraulic-fracturing in Picket Unit B Well 4-18 [located in Garvin County Oklahoma] certainly suggest that the earthquakes observed in the Eola Field [also in Garvin County Oklahoma] could have possibly been triggered by this activity. Perhaps I got lost in Mr. Holland’s grammar, but aren’t the earthquakes the adverse effects we’re talking about here? If a scientist has shown that fracking causes earthquakes, hasn’t he or she already demonstrated the adverse effects of fracking — namely, that it causes earthquakes? What minimization could he be talking about? Can you stop an earthquake once you’ve started it? Can it be hampered? Can it be softened? Or are we to understand that oil companies will pay to reinforce homes and repair damaged properties, foot medical costs, and make right any wrongful deaths? Because they obviously aren’t going to stop fracking — even if they believe it causes earthquakes. We know this to be true, because at least one energy company wholeheartedly agrees that fracking causes earthquakes — and they’ve decided to keep doing it anyway. Cuadrilla Resources, a British company, has admitted it’s “highly probable” their fracking operation caused a series of small tremors in Lancashire, England (read the press release here). Cuadrilla hopes to get right back to fracking, though, after implementation of an “early detection system” that will serve to minimize the seismic impact of their operations. I cannot imagine the circumstances under which I would discover that my actions had caused an earthquake. But I think if I did, my next move would probably be to stop doing whatever it was I was doing — not to figure out a way to live with the earthquakes. Because if energy companies actually believe that fracking causes earthquakes — and if they continue to frack — where does it end? If a company learned that fracking was responsible for international terrorism, would they stop? If they learned that fracking caused blindness in little orphan baby girls, would they care? If the sudden and contemporaneous deaths of all first-born male children within a hundred-mile radius of the Lincoln County injection sites was conclusively linked to fracking, would the drilling companies even slow down? And if not, would anyone in power stand up to stop them? In Strong Motion, Franzen uses the language of earthquakes to describe forceful love. “Strong motion” is, in fact, a geological term for the powerful turbulence that occurs near the epicenter of a quake. It’s a good metaphor, with deep roots. Love is a force of biological authority, after all, and we humans are just bits of dust and dirt and stone that have managed over millions of years to stand up, to think, to mate and bear children, and to find ways to protect what we love. I live in Oklahoma, with my wife and two sons. Monday night we felt another earthquake. I was lying on our bed, holding my youngest boy — he’ll turn two years old next month — when the shaking began. I agree with you 100%. It's not about whether Americans can understand satire nor is this a matter of free speech, as many blogs have argued–the cover is simply easy and dumb. I expect more from the New Yorker. I couldn't agree more. The New Yorker's defense of this cover as satire is an insult to satire. It doesn't say anything to anyone that will change minds or even make a clear attack on the false statements made about the Obamas. This is on the same level as a second-grader's picture depicting their teacher as a "poopie-pants." I can't believe I haven't heard crass commercialism mentioned (and I love the magazine too)! The reaction to the New Yorker cover has been absurd. If there is still someone out there who a) has never heard the rumor that the Obamas are America-hating Black separatist Muslim terrorists, but b) would believe as much if he heard it–is it really very likely that the cover of The New Yorker will provide his first exposure to those ideas? The idea that it is racist is nonsense: the Afro and fist-bump are not generalized racial caricatures, but rather direct allusions to specific accusations leveled at the Obamas. The right's coöption of each concept is fair game for satire, and it's not clear how artist Barry Blitt could have depicted them in a non-racially specific way. I have much more to say on these subjects here. The truth is if McCain was satirized on the cover, New Yorker libs would laugh their butts off. By way of rebuttal, Anonymous: I'm a "New Yorker lib," and while I won't speak for Max as to his political leanings, I agree with his statement, in the post above, that the Cheney Brokeback Mountain cover was beneath the New Yorker as well – ephemeral, easy, and unfunny. I might have written a post on it, had I not made a resolution to try not to post on ephemera. It seems, alas, that the partisan New Yorker cover (as opposed to the politically engaged New Yorker cover) is becoming less of an epiphenomenon and more of a frequent occurrence…and thus is worthy of a post. As Banned Books Week closes, we naturally have news of more attempted book bannings. In Atlanta, a woman is leading a crusade to have the Harry Potter books removed from school libraries because they are “an ‘evil’ attempt to indoctrinate children in the Wicca religion.” And in Houston, in a particularly poorly conceived move, concerned parents are trying to ban Ray Bradbury’s anti-censorship tome Fahrenheit 451, after a student was offended by “the cussing in it and the burning of the Bible.” Although these efforts are distinguished by being ill-timed, they’re really no different from the book banning attempts that so frequently make the news. It seems like nearly every week there is a new book banning story to read as I look through the newspaper book pages.It has occurred to me, in reading all of these stories that these attempts to ban books almost never succeed, and that if any of these would be book banners read the paper they would know this. It follows then that a lack of curiosity, awareness, and probably education are all factors that breed book banners. The smaller one’s world is, the more likely he is to want to ban a book. In this way, the book banner is like the fundamentalist who desires to impose an irrational act on others in the name of blind faith. It is disconcerting to me how much noise these attempts sometimes make — the battles can rage on for weeks in local newspapers and at school board meetings. Still, it is heartening that books are so rarely banned, and that so many are often willing vocally to defend them.